I received a few communications on Thursday saying that they would respond, but I had one very good response, and it came from Representative Edward Lindsey. I will post his response below, but I must say that I was impressed by the clearly well thought out response to my letter. There are many issues and ramifications to any decision that is made whether it be to act or not act, but the decision should be clear, concise, and as painless as possible. I know that Representative Lindsey's comments were "designed to begin the discussion on how to deal with the financial shortfalls facing local school systems," but such a broad reaching action could cause undue harm on those that quite literally do the most for our state day in and day out. Thank you for your thoughts and concern regarding teacher furloughs. Let me first emphasize that at the present time furloughs are not in the proposed State budget. In addition, the proposed budget continues full funding for school nurses, graduation coaches, RESA, ETTC and National Board Certification. These were all priorities this year of education advocates in Georgia. My comments the other day were designed to begin the discussion on how to deal with the financial shortfalls facing local school systems caused by declining revenue in their local areas. I believe strongly that teachers and local school systems need to continue the discussion amongst themselves and consider the possibility of up to six day furloughs. The problem is that in our present economy many school systems are reeling from revenue shortfalls and the only legal alternative that they have for cutting costs is to lay off teachers. Furloughs provide a second alternative to save teachers’ jobs and to keep these professionals in the classroom. In furloughing six days we will in effect be rolling back for one year the 2009 teacher pay raise. Please recall that teachers in this State were the only State employees that received pay raises in 2009. That said, I do not underestimate the financial hardship this would bring to families of teachers. However please keep in mind it is my intention to plow these savings directly back into the classroom. This could preserve between four to five thousand teacher jobs in Georgia. 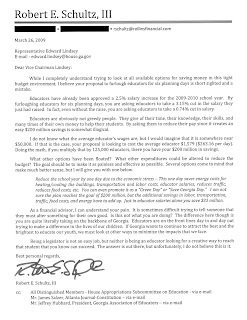 Last week, Georgia State House Representative Edward Lindsey made a proposal to the House Appropriations Subcommittee on Education where he serves as chairman. In his proposal, Georgia's 125,000 educators would be furloughed during six planning days. This essentially means that every educator would lose six days of pay. Six days of pay may not sound like that big of a deal to you. Of course, that is until you do the math. Look at your contract. It is for 190 days. Take your annual salary and divide it by 190. Now take that and multiply it by 6. That is the gross deduction in pay that you would be losing. For someone making $50,000, they have now lost $1,579 in pay. Of course, this would save Georgia $200 million. Georgia's educators were just awarded a 2.5% cost of living increase for the 2009-2010 school year. By doing a bit of math, these same educators that thought they were getting raises would now lose 3.15% of their salary. Even with the raise factored in, Georgia's 125,000 educators would lose 0.74% of last year's salary. On Wednesday, I wrote the letter at the bottom of this post to Representative Lindsey asking him to look at other alternatives. There must be some out there even beyond the one that I gave to him in my letter. I suggest reading the letter, doing some research, and discussing it with your colleagues. If this is a road that the legislature may go down, it is always better to have some alternatives for them to consider. On Friday, I will post any and all of the responses I receive. For me, there is nothing worse than incorrect information. We all make mistakes and misstatements, but just complete an utter incorrect information is just wrong. When I do it, I try to apologize and at least be humble. Earlier today (Tuesday), I watched some of the U.S. House of Representative's Financial Services committee meeting with Federal Reserve Chairman Ben Bernanke, U.S. Secretary of Treasury Tim Geithner, and Federal Reserve Bank of New York President William Dudley testifying. I can honestly say that I have never been so embarrassed to see our politicians in action than I was today. Without calling out individual Representatives, let me just say that the "Grill on the Hill" as CNBC was calling it this morning prior to the hearing was exactly right. I heard one Representative essentially let Secretary Geithner know (by just about screaming) that it was evident that Goldman Sachs was behind the various bailouts to make money (completely untrue). In fact, they asked if his Chief of Staff worked at Goldman before. When Geithner said that it was one of several places, the accuser just kept on about how it was all a conspiracy (just do not ask the accuser about some of the various things that have surfaced lately about their personal life). Another asked where in the Constitution did the Treasury or the Federal Reserve have the power to make their various moves. When Geithner tried to answer about the various powers that Congress had legislated, the questioner stopped him and said... the Constitution. Finally, one made me so angered that I felt the need to write a letter explaining my embarrassment. 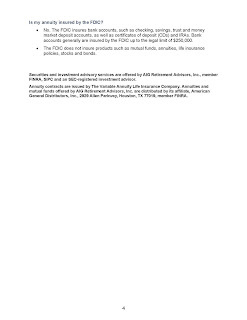 The Representative essentially accused Bernanke and Geithner of using the AIG bailout funds to help any person with an AIG retirement account, so unlike the rest of us that loss "40% to 50%," they did not lose anything. How do you answer a question that is so far off base that it is just plain wrong? 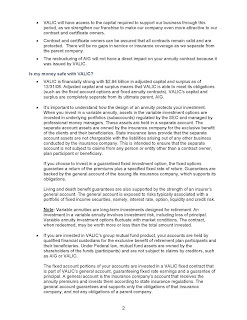 I nicely (unlike the tone the Representative took with Bernanke and Geithner) tried to explain in my letter that the AIG VALIC accounts (many of my readers have e-mailed me their statements) lost just as much as everyone else. They are invested in the same type of mutual funds that everyone else is, and they shared the same pain as everyone else did as the stock market plunged in the fall. How were those accounts saved again? I am not going to call any one person out, but instead I would like to let it be known that if you do not have all of the information, please get it prior to asking questions. I was embarrassed by the lack of respect shown to these men testifying and the lack of preparation prior to asking questions. I finished my letter with: "These are troubling times for the nation, economy, and stock market, and it will take a continued collaborative effort to move forward. I do not agree with all of the moves of our leaders from either party, but true bipartisan efforts will help to make a difference. I hope that you agree and that calmer heads will prevail." I am sure my comments will fall upon deaf ears, but at least I have tried to speak. Let me go bang my head against the wall on another subject. I know for many educators it is Spring Break season. You are on Spring Break, have been on Spring Break, or are about to be on Spring Break. For me, it is TAX SEASON. This is an incredibly busy time of the year to say the least. At my firm, like many other CPA firms, we will work all of March and until April 16 (one extra day for any e-file problems). Out of 47 days, we will work 44 days. Yippee! Anyway, I have been busy watching the markets, reading about all of the new taxes, plans, and programs, and trying to figure out the best way to guide everyone through the current situation. I know it does not seem like it, but things are starting to look better. Really, they are. In the meantime, I did want to pass along a few editorials that I have read recently (click on each to view the entire article). Also, later this week, I will weigh in on the current Georgia legislature proposal of furloughing teachers for 6 days next school year. This seems like a ridiculous proposal, and I hope to be able to include a letter I write regarding it. Enjoy the editorials, thanks for the e-mails, and I hope your Spring Break is, was, or will be relaxing. Education’s Ground Zero - By Nicholas D. Kristof - The New York Times - "The most unlikely figure in the struggle to reform America’s education system right now is Michelle Rhee. She’s a Korean-American chancellor of schools in a city that is mostly African-American. She’s an insurgent from the school-reform movement who spent her career on the outside of the system, her nose pressed against the glass — and now she’s in charge of some of America’s most blighted schools. Less than two years into the job, she has transformed Washington into ground zero of America’s education reform movement." Opposing view: Score Choice helps everyone - By Laurence Bunin - USA Today - "New policy gives students a break if they have a bad day on test day." Our view on college testing: Defining the SAT downward - By USA Today - "Score Choice policy reduces data, benefits affluent test takers. When thousands of high school students take the SAT on Saturday, they will have a big advantage over students in years past: If they do badly, no one has to know. No matter how many times they take the SAT, they can have only their best total score sent to their target colleges." 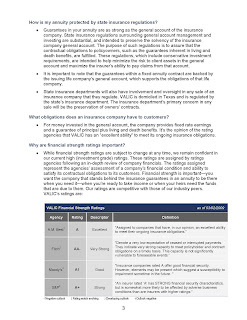 I also write a daily blog for my financial advising firm, and yesterday, I wrote the following blog after several conversations with one of my partners. There was an overwhelming response of support for it, so I thought I would post it here as well. I hope you enjoy it. Politics. That one simple word conjures up various thoughts in everyone's mind, and yet it is something we all must deal with every day. In our office, we sometimes have some pretty lively debates regarding economic issues, the stock market, and most assuredly anything political. I bring this up because there has been one issue recently that has allowed us to come to the same conclusion - how to fix housing. More than a month ago, we sat around listening to the talking heads on CNBC, CNN, Fox News, etc. go back and forth about how to fix housing. We have all heard about or seen some of the rants from both sides of the spectrum, and in the end, everyone walks away a little more fired up against the other side. Does it really have to be this way? If every single homeowner were allowed to refinance and get a benefit, would everyone still be yelling about helping their neighbor? Everyone benefits, and for those that are renting, become a homeowner by purchasing a home with the $8,000 credit and a 4.5% loan. Now this is an issue. If this is due to a change in income, then there may be no alternative to foreclosure. At the same time, by cutting the rate from 6.25% to 4.0%, a $200,000 mortgage goes from $1,231.43 a month to $954.83 a month. This is a savings of $276.60 a month, $3,319.20 a year, or $99,576 over the life of the loan. How stimulative would that savings be? Also, the current Homeowner Affordability and Stability Plan could still be used to help those that really have a need. A reduction to 4% across the board though removes some of the work to allow those that are in dire need to be serviced more effectively. We have all listened to the arguments about "being underwater" in your mortgage. If being "underwater" in a loan is a reason for loan modification and a reduction of principal, I am buying a new car tomorrow. I could go buy that nice $50,000 Lexus, drive out, and refinance it for loan modification reasons immediately with probably $10k knocked off my principal on day one. When you buy a new car, it is usually financed for 5 years, and most estimates are that you are underwater for the first 3 years. Do most people stop paying because they are underwater? The answer is no. Should a house be any different? The mortgage is for 30 years, and assuredly, you cannot be underwater for all of it. I read an editorial that said some mortgages are now 160% of the value of the house. Once again, a new car drops in value by at least 20% in the first year. While 160% is high, the housing market will recover given time. We do not need to simply focus on the here and now but the future as well. Another editorial said that without principal reduction, “they would be renting their homes from the lender.” For $950 a month in principal and interest payments, isn’t this as inexpensive or even less than renting a comparable house? Additionally, the mortgage interest is tax deductible, so it would be even more affordable once that is calculated in to the bottom line. If someone was on the fence about selling a house, they might just want to stay there. Go forward three years, and now, that 4.0% mortgage is very valuable. If I am thinking of selling my house in 2012, it is going to need to be a good deal because I will be giving up a great mortgage to go out and buy a house at current mortgage rates. This is going to keep the supply of the existing home sales down to those that really want to sell. A reduction of supply means generally higher home values for all (supply and demand). The main goal of the plan would be to lower the debt payments which would create excess cash. This excess cash could be used to pay down debt or added to savings, but the truth is a sustained reduction like this would most likely be used as increased spending with only a small amount to debt reduction or savings. Most of the data points to the fact that “large” stimulus payments are used for debt reduction or savings, but sustained increases are generally put back in the “budget” of the family and spent. This is one reason that President Obama’s American Recovery and Reinvestment Act included the Making Work Pay provision. This provision would give a refundable tax credit of up to $400 for working individuals and $800 for married taxpayers filing joint returns (there are phase out provisions). For people who receive a paycheck and are subject to withholding, the credit would typically result in an increase in take-home pay of about $8-$10 per week. 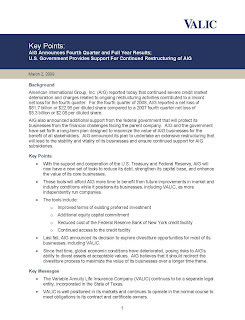 Since the vast majority of loans would be refinanced in this scenario, it allows Fannie Mae/Freddie Mac to regain some control and repackage the loans in an orderly fashion. This would also automatically reduce some of the “toxic assets” being held by the banks as they are refinanced. The remaining toxic assets could then be dealt with on a smaller scale, and the loan loss reserves set aside by the banks would most likely be more than adequate to handle any further issues. One of the other added benefits from this plan is that since the old “Liar Loans” are no longer available, this plan would help verify the income using real standards. No longer will a loan with a made up income be used to push through underwriting. This would also help with the affordability and risk associated with each loan – once again to allow them to be packaged together with real risk ratings. We are sure that somehow even this plan would be an issue because nothing is simple when you hand anything off to our government, but ANY plan should be more inclusive and not exclusive. Penalizing those that “have been responsible” is not the solution. When we allow as many people as possible to participate, the resulting stimulative effects just grow. On the tax side of the plan, the mortgage interest would decrease thus the net taxable income side would increase. Yes, this would probably increase taxes just a hair because you would have a smaller deduction, but the net effect would still be extremely positive. This is not a plan without expense, but it allows for greater involvement and thus acceptance by the public. This plan has both short and long term benefits since the interest rate decreases are for 30 years. We would be building a continued consumer boom with less debt accumulated and continued spending. This is much more responsible than continuing to push consumers to spend using credit instruments and building a debt mountain. Your thoughts on the plan are welcomed. President Obama said Tuesday that the nation must overhaul its education system and dramatically decrease the drop-out rate among students to remain competitive in the global economy. In an address to the Hispanic Chamber of Commerce, Mr. Obama issued a challenge to states to increase the quality of reading and math instruction to keep American students at pace with other countries. It was the first major education speech Mr. Obama delivered since taking office seven weeks ago. The president challenged teachers unions, renewing his support for a merit-based system of payment. He also said adult Americans needed to take responsibility for improving their own education, in addition to improve the education of their children. The address on Tuesday was the first step in laying out the president’s agenda to improve American schools, officials said, with more specifics to be outlined in the coming weeks to Congress. Mr. Obama set a goal of the United States having the highest proportion of college graduates in the world by 2020. Mr. Obama called for continued funding of charter schools, which his administration refers to as “laboratories of innovation.” Teachers’ unions oppose the schools, saying they take away funding for public schools. The president also challenged unions, a reliable Democratic constituency, by promoting a merit-based system of payment for teachers, an idea he pledged to support during the campaign. There is no other way to explain the current financial markets other than dismal. Absolutely dismal. I have some commentary below, but I wanted to review a few items on the allocations. Diversify! You have heard it many times before, but it is so important. Pay attention to your risk tolerances. If you are having trouble sleeping, move some more back to bonds and cash. I would still stay away from the fixed annuity. The interest rate is pretty good, but the timeframe to actually be able to withdraw the funds is the killer. The bond market even with the current stock market has started to improve. The movements by The Fed has injected liquidity like never before, and the global response has helped tremendously. It is not back to "normal" yet, but it is progressing (fixed income was recommended in January). Research, research, research! It can be confusing, but the more knowledgeable you are, the better decisions you will usually make. This is not the end of the world. I know it is hard to believe, but America will survive. As Warren Buffett's letter to Berkshire Hathaway shareholders said over the weekend, "Our country has faced far worse travails in the past," he said. "Without fail, however, we've overcome them." The stock market hates uncertainty, and the new administration and Congress have kept everyone guessing. Housing plan... yes or no? Still no details there. How will the second $350 billion in TARP funds be used? Not much clarity there either. Raising taxes? Clarity yes, but is this the environment to take available capital away from consumers? You get the drift. It is not all Obama's fault obviously, so please do not jump to that conclusion. What we need though is some real direction, and thus far, it has been lacking. The stimulus finally passed, and it should start to breathe a bit of life back into the economy. Hopefully some of the targeted tax cuts will work quickly, and then the stimulus spending will kick in. On that front, let's hope the billions thrown at Education will be used accordingly. Tough times are ahead, but the country, economy, and market have been through worse, and they will pull through again.